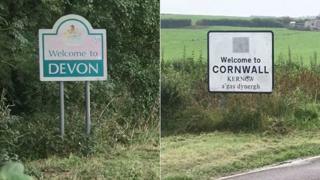 Politicians are protesting against fresh plans for a cross-border parliamentary seat between Devon and Cornwall. The report from the Boundary Commission includes proposals to create a so-called "Devonwall" seat. Cornwall Council leader Adam Paynter says he will strongly object to plans to join Bude and Launceston in north Cornwall with Bideford in north Devon. The commission said it was "confident" in its new map and proposals. The review has been carried out after Parliament said the number of constituencies across the UK should be reduced from 650 to 600 with roughly the same number of electors in each - between 71,000 and 78,500. The proposed constituency currently consists of two Parliamentary seats: Torridge and West Devon, which is held by Conservative Geoffrey Cox, and North Cornwall, which is occupied by Scott Mann, also a Conservative. Image caption The new boundaries would join Bideford, Bude and Launceston. Mr Paynter, who is also the Liberal Democrat councillor for Launceston, said: "It's something we're very passionate about - the border has been there for over 1,000 years and hasn't been crossed by anything like this. "To ignore it now, especially when Cornwall has achieved minority status, it does contravene the essence of what that is." On Monday, Labour MP for Plymouth Sutton and Devonport Luke Pollard described the idea of joining Devon and Cornwall under one seat as "undemocratic" and "insulting". "This is nothing less than a cynical attempt at a bureaucratic power grab making it easier for the Conservatives to win an election before a single vote is cast." "South West MPs have a chance to stand up for our region and keep Cornwall whole by voting against these changes," he added. Similar plans to create a cross-border political constituency between Devon and Cornwall were defeated in 2013. Now the proposals have returned, the Boundary Commission said the "Devonwall" area was "unavoidable" if plans to make constituencies more equal in size were to be successful.